A picture paints a thousand words, apparently. 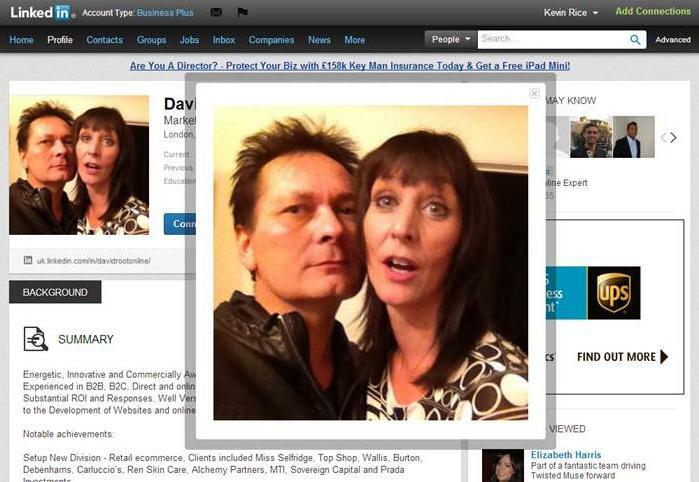 So just look at these classic profiles on the business network LinkedIn.com and wonder how it is that these people thought that it could ever be a good idea to portray themselves to potential business contacts in such unusual ways, leaving you ultimately lost for words to express your feelings. Step forward Mr Scott, the self-proclaimed ‘Founder Potential’, whatever that means. His role ‘is to advise, laugh, argue with people’. His first job was being Mickey Mouse for Walt Disney. Who are we to disagree? FAIL! The next example clearly is proud of his camouflage and weaponry skills. And who wouldn’t trust a man who would drop everything to fight for his country, quicker than you can say home grown terrorist. Even when he inexplicably informs us that ‘butterflies taste with their feet’ and then follows that bombshell (he may actually own grenades) with the question: ‘Whats HOT? What do you need from me? I can capture it or supply it for you.’ I bet you can Terry, I bet you can. FAIL! Representing the girls is young Anna from Russia. She is just so cool. She’s being punched in the chin, but is still holding the pout. You go girl! Who needs to see your eyes anyway? FAIL! What’s not to like about an image of someone sucking on an unlit cigarette? It just exudes class. Either than, or it exudes something else, rather less appealing. FAIL! Oh Adam, you’re another one who’s just too cool for school. You’re a ‘Fire Starter’ (must come in handy for barbecues) and ‘Marketing Legend’ who specialises in ‘hustling’? Sure of yourself, aren’t you? FAIL! I felt this one deserved to be enlarged due to its disturbing nature. Apparently, this man is ‘a guru’ and the woman is ‘ma waaafe’. Would you trust this man with your business? Or to be alone around your children? FAIL! The moral of these epic failures, and there are many more out there, is that you should never present a side of yourself that you would not be prepared to reveal at a job interview. And I definitely wouldn’t recommend turning up in full combat gear, holding a rifle. I am so glad I didn’t qualify for inclusion!! That’s a fine line up you’ve presented to us, Stewie. Delusion doesn’t even come close to describe what we’re witnessing here. I’ve been unsure about signing up to LinkedIn for some time: you’ve just crystalized my fears. Thank you, sir, for your sterling effort. These are just the tip of the iceberg! Despite these specimens, I think LinkedIn has its advantages.